Even as the origin of the 2016 surgical strike video remains unknown, its release has led to a debate in the military establishment. Though the government has not taken the onus for its release, it has come out strongly to defended it. Majority of Army officials are against the move as they believe that it (release of video) has comprised the 'tradecraft' of the special forces. Lieutenant General P.C. 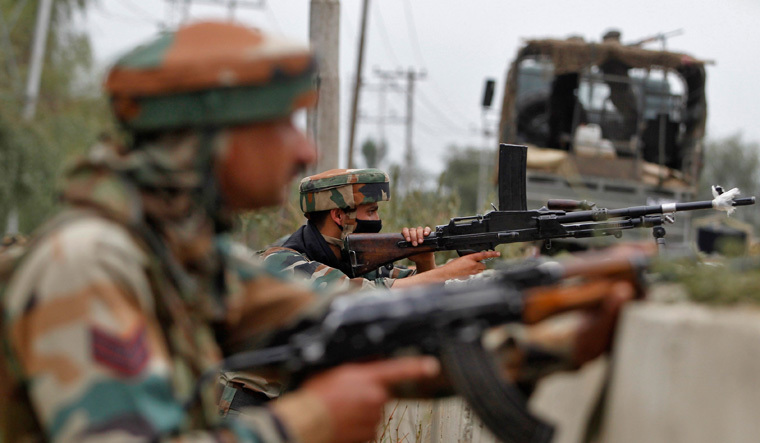 Bhardwaj (retd), former vice chief of the Army and a special forces officer who spent several years of his career operating in Jammu and Kashmir, believes that the forces compromised their specialised methodology which they mastered after years of training. "At the first place, I don't advocate release of videos related to special forces or special operations and others. These are highly specialised methodology operations, which we learn after putting in years of hard training. It is not at all good at the strategic level," Lt. General Bhardwaj told THE WEEK. "I really don't know about the compulsion behind releasing the video, but no force in the world makes its special operations public, he said, adding that making classified things available on public domain reflects poor thinking. Echoing similar sentiments, Lieutenant General Vinod Bhatia (retd), former Director General Military Operations, who was also a special forces officer, said special operations should never be publicised.
" First of all, I would say we should stop politicising the Army. Release of this video for any particular gain is not good at all. Surgical strike cannot be a one-off one. You are going to do it again, and if you release such a video, you are revealing too much to your enemy," Lt. General Bhatia pointed out. "Special operations are very special. Release of any such video makes it easy for an enemy to make out the capability and capacity we have. So, the next time you do a surgical strike, it becomes much more difficult. Being a special officer, I strongly believe that such tactical and strategical level details need not be in public knowledge," he added. On the intervening night of September 28-29, 2016, the special forces carried out a cross border strike on the terror launch pads situated in Pakistan-occupied Kashmir. The surgical strike was Army's response to an attack by Pakistan-based terror outfit Jaish-e-Mohammed on an Indian Army camp in Uri close to the Line of Control in which 19 soldiers were martyred. Nonetheless, Lt. General D.S. Hooda (retd), who was the northern Army commander and had supervised the surgical strike, is satisfied with the release of video. Lt. General Hooda was the first official who confirmed the authenticity of the video. "Personally, I feel this video should have been released soon after the surgical strike. Our guys did an outstanding job. Despite that, there were always nagging questions about its veracity as well its authenticity,” he said, adding that there were also some who said the entire operations was over-hyped. “But, I am some way quite satisfied that it has come out. I cannot comment on its timing, but it should have come much earlier." Lt General Ata Hasnain (retd), who has commanded Srinagar-based 15 Corps shares a similar opinion. "I feel the videos should have been released immediately after the event for their effect and credibility to be much higher. Nevertheless, even now, the effect can be used to brand Pakistan as sponsor of proxy war in Kashmir and display India's military capability," he said, adding that the opposition is not taking into consideration the context the times of the release. "Operations in Jammu and Kashmir were much less in the public space in the past. Army responses across the LoC needed to be kept under wraps. No longer. Social media and evening television has changed the discourse of information handling. Government ownership is imperative for most of such operations as it inspires confidence in the people and dilutes adversary confidence while nailing their lies,” he said. Release of video has also given an opportunity for politicians to wage war against each other. Congress spokesperson Randeep Singh Surjewala said the BJP is trying to gain political mileage from the release of the video by crediting the surgical strike to Prime Minister Narendra Modi. "The BJP shamelessly used the surgical strike during the assembly elections in Uttar Pradesh." Responding to the claim, Union Law Minister Ravi Shankar Prasad said Pakistan would be happy with the Congress' statements. "Terrorists in Pakistan will be extremely happy with the Congress. The Congress will get a certificate from some terrorist organisations of Pakistan just like Ghulam Nabi Azad got the certificate from Lashkar-e-Taiba," he said.